Old or spent printer cartridges can pile up quickly, especially if you own more than one printer. With over 350 million ink and toner cartridges ending up in our landfills each year, proper cartridge recycling is more important than ever. Thankfully, many convenient cartridge recycling solutions exist…read on to find the best option for you! Many office supply retailers will gladly take back your used or spent cartridges. If you have an office supply store in your area, check their website to see if the store accepts ink and toner cartridges, most will recycle them in a heartbeat! Local recycling facilities are a lot easier to find than you might think. If the neighborhood big box store isn’t a viable recycling option for you, visit Earth911® to find the recycling center nearest you. Just type in the material you would like to recycle (ink and toner) add your zipcode and you will be shown an extensive list of recycling locations in your area. Earth911.com also offers an easy to use recycling app called iRecycle, which features more than 1,600,000 ways to recycle over 350 materials. If you have other recyclable goods that you need to dispose of like paint or batteries, you can easily cross those off your to-do list too! Earning extra cash is easy with the eCycle Group®. Just collect at least 20 items or 20 pounds worth of qualifying product, print out your free shipping label and send off your empty cartridges. The eCycle Group works with thousands of businesses, schools, churches and nonprofits throughout the country, with many organizations using the service as a fundraising opportunity. They even offer a number of free fundraising tools directly on their site, including flyer templates and tips for a successful recycling campaign. In order for your cartridges to be accepted, they must be on the pre-approved recycling price list and received in good condition. If you are mailing cartridges, be sure to individually wrap each cartridge in bubble wrap or newspaper to minimize damage in transit. Keep in the mind, the company only accepts original brand cartridges, damaged and remanufactured cartridges are not eligible. Checks are issued monthly and profits range anywhere between .23 cents to $9.00, depending on the cartridge. If you have an original brand ink cartridge that you have used just once, there is a very good chance you can refill and reuse that cartridge with the correct ink refill kit. Most refill kits include a bottle of ink, a syringe, screw tool, plastic gloves and refilling instructions. To refill, you will need to manually inject the appropriate level of ink into the cartridge. Once the cartridge is at capacity, you should be able to reuse the cartridge again and print as expected. Be sure the refill kit you’ve purchased is intended for your specific cartridge series, refill instructions and ink capacities vary across brand and cartridge type. Inkcartridges.com offers a number of refill kits for some of our most popular ink cartridges, including kits for HP® and Canon®. Please note, ink cartridges can only be refilled a couple of times. Eventually, your prints will start to diminish in quality and you will need to buy a brand ink new cartridge. With so many eco-friendly options available, recycling your printer cartridges can easily become routine. Educate others on the importance and simplicity of recycling. 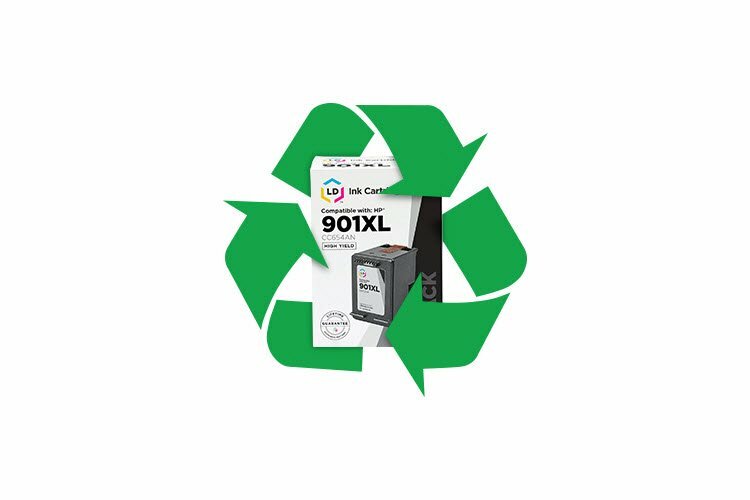 By making a cooperative effort to properly dispose of our ink and toner we can prevent a significant number of cartridges from ending up in the landfill and collectively reduce our carbon footprint!